Best Of The Sea Recipe Challenge: Win A Trip To Fiji! Think you have a winning tuna recipe? 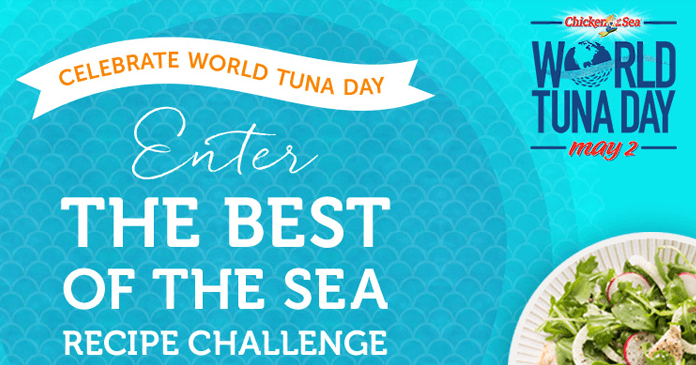 Chicken Of The Sea invites you to enter your favorite tuna recipe in the Best Of The Sea Recipe Challenge for a shot at being featured on the Mermaid’s Official World Tuna Day Menu. Plus, a chance to win prizes like $100 or a trip to Fiji, along with daily drawing for $50. Submit a photo of your favorite tuna recipe now through April 22nd at chickenofthesea.com/bestofthesea. Daily winners of $50 will be announced on Facebook. Then, vote for your favorite recipes between April 24 and April 28. The Top 8 voted recipes and their creators will be announced on World Tuna Day (May 2). Winners will receive $100 and will be automatically entered for a chance to win a trip for two to Fiji. Submit your favorite tuna recipe. Provide a brief description of the recipe as well as a picture of the finished/prepared dish. At the conclusion of the Recipe Submission Period, the Sponsor’s judging panel will determine 25 finalists on the basis of “most appealing/interesting” recipe submitted. The Finalists will advance to the user voting period. Visit chickenofthesea.com/BestoftheSea during the User Voting Period. Cast your vote for your favorite Recipe Submission. At the end of the User Voting Period, the 8 Recipe Submissions receiving the greatest number of votes will be determined as the recipe contest winners. A total of 15 Daily Winners will be randomly selected from Recipe Submissions and each will receive a $50 VISA Gift Card. A total of 8 Recipe Contest Winners will be determined via the decisions of the Sponsor’s judging panel and each will receive a $100 VISA Gift Card. $500 travel allowance paid by check. The Chicken Of The Sea The Best Of The Sea Recipe Challenge is open to legal residents of the 50 United States and the District of Columbia who are at least 18 years of age at time of participation (except Alabama and Nebraska residents must be at least 19 years of age and Mississippi residents must be at least 21 years of age at time of participation). Begins April 3, 2017 at 12:00:01 AM PT and ends at 11:59:59 PM PT on April 28, 2017. There is no limit to the number of Recipe Submissions you submit, however each must be unique and completely different from any earlier Recipe Submission you have made. On or about May 1, 2017, a random drawing will be conducted to select one Grand Prize Winner. The total value of all prizes in the Promotion is $6,416. To request a list of all winners by mail send a hand self-addressed, return postage affixed envelope for receipt no later than May 15, 2017 to: Chicken of the Sea World Tuna Day Winners, PO Box 26597, Scottsdale, AZ 85255. Sponsored by Chicken of the Sea International, PO Box 85568, San Diego, CA 92186. Administrated by Extra Mile Marketing, 9443 E. Conquistadores Drive, Scottsdale, AZ 85255-4344.